and as a result, launched David Shepherd's career as a serious wildlife artist. Many old copies of 'Wise old elephant' can easily be found, unfortunately, due to the lack of poor inks used, most of them are badly faded. Many were heatsealed onto canvas and then varnished to give the appearance of an original painting..
David Shepherd, CBE, FRSA, FRGS, OBE. and also a passionate conservationist and he freely admits that he owes much success to the animals he paints. and enjoys being known as a natural promoter and an ardent ambassador for conservation; it's the way he is. Explaining that he became an artist in childhood because he couldn't do anything else. I went rushing out to Kenya with the incredibly arrogant idea that I was God's gift to the National Parks. It was a disaster. I knocked on the door of the Head Gamewarden in Nairobi and said, 'I'm here, can I be a game warden?' I was told I wasn't wanted. My life was in ruins; that was the end of my career in three seconds flat." "Up to that point, my only interest in art had been as an escape from the rugger field. The game was compulsory at school and I was terrified of it. comfortable and painted the most unspeakably awful painting of birds." Deflated and homesick, he took a job as a receptionist in a hotel on the Kenya coast; the salary was one pound a week. culture-starved inhabitants of the town and paid my passage home to England on a Union Castle steamer." Arriving home, penniless, he had two choices,Mr Shepherd decided he could either become an artist or a bus driver. Since he suspected that most artists starved in garrets, life as a bus driver seemed the safer bet. Limited edition, prints for sale. 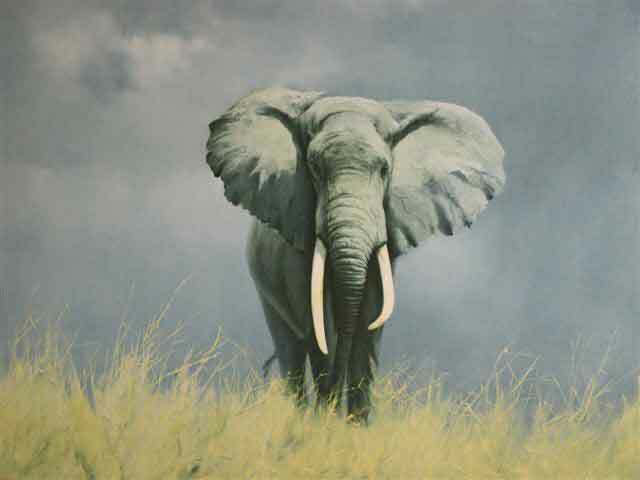 Cornwater Fine Art specialises in David Shepherd limited edition prints. We specialize in signed prints and original paintings and drawings by the world acclaimed artist L.S. Lowry click. A watercolourist, whose work needs little introduction in the world of art is Sir William Russell Flint read here.